I couldn't agree more....and I believe that 99% of the time, when illegals are apprehended, they DO get treated humanely and THEN some...if you can call being apprehended 'humane'. All BP agents carry water, etc. Where these folks mostly suffer is BEFORE they're caught, often being brutalized or victimized by their own coyotes, or by gangs that wait to 'prey' upon them along the border, or simply by suffering in the 'elements' (heat, cold, etc). But this can't really be called 'mistreatment'...it's a case of someone being willing take a HUGE gamble for something they want, but can't legally 'get'. Sad and moving, for sure, but that's not 'mistreatment'. The REAL 'mistreatment' is the unfair society that originally caused these folks to want to leave home in the FIRST place. Once again we agree, especially the society that caused these people to want to leave home in the first place. Yes, I agree that MOST border patrol agents are compassionate, I have seen a few that were not, but it was usually the "newbies" and I guess they thought they had something to prove. 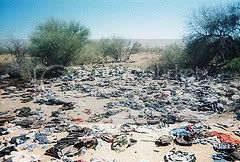 I know that a lot of people accuse them of trashing the desert and some may, but some are made to leave their personal belongings if they cannot keep us, and I have never met a woman that would leave her purse with all of her family photos in it, if it were not against her will. My hope is that something either with their goverment or whatever that will benefit all. 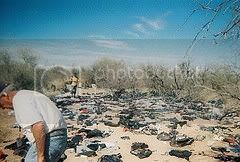 I thought you might like to see the evidence of a trashed desert. It's not an accusation, it's a fact. And what's even more disgusting is that some areas by border crossings actually consist of PRIVATE PROPERTY! I would be livid if I had a few hundred acres, left my house in the morning to do my daily survey only to find my property trashed. I support The Minutemen 100%. It is our duty as American citizens to protect our country within our legal limits, especially if our government fails to do so. 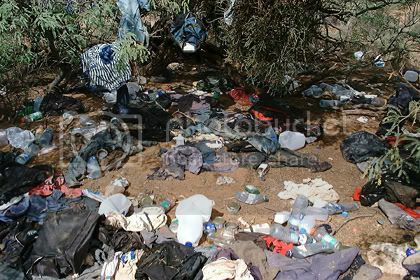 And there are groups several in fact that go out in the desert and clean them up at least once a week. I'm not sure what the minutemen have to do with it, unless they clean up the desert. The goverment has laws, so maybe they will decide to do something about it, but I would not hold my breath.